Between January 19th and January 23rd, Jaipur was glittering with a plethora of literary stars, as India’s biggest, most influential literary festival: Jaipur Literature Festival was successfully conducted by TeamWork Arts team. Started in 2006, this was 10th edition of the festival, which is has been described by Miranda Seymour as “the grandest literary festival of them all”. Close to 5 lakh visitors thronged the festival, as ideas, culture, tradition and aspirations intermingled with one another, creating a kaleidoscope of awesomeness! Diggi Palace was once again the venue for this fest, where readers, writers, authors, musicians, movie directors, literary agents, journalists, bloggers and anyone, everyone associated with literature and art descended, soaking the aura fuelled with expression of art and culture. The theme of the festival was ‘The Freedom to Dream’, and some intense, insightful debates and talks took place, which perfectly matched the theme of the festival. While some of the stars like Rishi Kapoor, Suhel Seth and Gulzaar, along with William Dalrymple (who is also the co-director of the festival) drew massive crowds within the carefully maneuvered lawns of Diggi Palace, debutant authors and poets who launched their first creations too hogged the limelight, and received praise for their works. In fact, when Rishi Kapoor commanded the stage, and the Front Lawn was brimmed to capacity, security guards had to push back the eager youths, who wanted a single glimpse of the Bollywood stars. When he sang ‘Main Shayar to Nahi’, then the entire audience broke into loud applause. One of the best part of the festival was the excellently moderated panel discussion, where in moderator Jyoti Malhotra, who is a journalist, carefully and skillfully guided Suhel Seth and Hindol Sengupta into an engaging, pretty intense debate on the topic of fiction writing in contemporary India. Demonetization, which was a hot topic in the country, found its flavours in the festival as well, as panelists debated the pro and cons of the exercise; and the audience received some interesting opinions and feedbacks on the subject. Rsj Sen, the famed movie critic moderated an interesting discussion cinematographers in movies, and the scope of the discussion covered both Hollywood and Bollywood. Vikas Swarup, whose book Q & A formed the spine of Oscar winning Slumdog Millionaire drew huge crowds as well, as movie lovers attempted to peek into his mind and understand his thought process. Overall, around 300 writers, authors, socialists, poets, movie directors, and literary stars visited the festival, and enthralled the crowd with their intellectual discussions and insights. 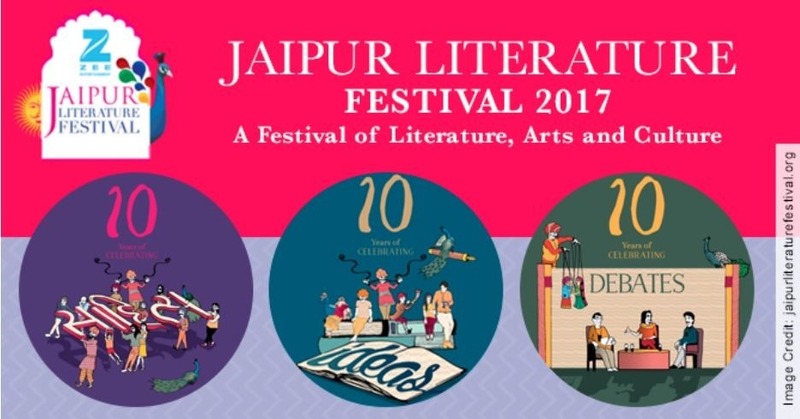 Just like previous years, Jaipur Literature Festival was a massive success, and we are looking forward to their future editions. More power to JLF Team! "A Galaxy Of Literary Stars Descended At Jaipur Literature Festival 2017 - A Review", 5 out of 5 based on 2 ratings.